 How did enslaved African Americans envision and pursue freedom?  How did free African Americans participate in anti-slavery campaigns and in individual slaves' efforts to be free?  How did these efforts set the stage for African Americans as a free people after the Civil War? - Suicide as freedom, narrative and newspaper selections, 19th-20th c.
Image: Photograph (tintype) captioned "Two brothers in arms," between 1860 and 1870. 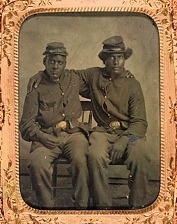 LOC note: "Two unidentified African American soldiers, full-length portrait, wearing uniforms, seated with arms around each other's shoulders, facing front." Courtesy of the Library of Congress Prints and Photographs Division, Gladstone Collection.